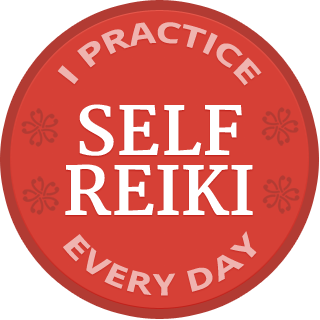 I have added this badge to my Reiki page thanks to Pamela Miles of ReikiMedicine.org. I’m not sure if many people know that you can Reiki yourself. You can send Reiki to yourself immediately after being attuned to the very first level of Reiki. What a gift and a life changing experience! It’s empowering to be able to help yourself physically, mentally, spiritually and emotionally with a natural, loving, healing energy that has no side effects. An intuitive I follow on Facebook posted the following information from Judith Orloff. Orloff is a fantastic resource for those who are highly sensitive to others’ energies or empathic. Please visit her website because she has an incredible amount of information there to help you protect yourself emotionally. In the meantime, here is the most basic information to start. First, ask yourself: Is the feeling mine or someone else’s? It could be both. If the emotion such as fear or anger is yours, gently confront what’s causing it on your own or with professional help. If not, try to pinpoint the obvious generator. For instance, if you’ve just watched a comedy, yet you came home from the movie theater feeling blue, you may have incorporated the depression of the people sitting beside you; in close proximity, energy fields overlap. The same is true with going to a mall or a packed concert. When possible, distance yourself from the suspected source. Move at least 20 feet away; see if you feel relief. Don’t err on the side of not wanting to offend strangers. In a public place, don’t hesitate to change seats if you feel a sense of depression imposing on you. For a few minutes, center yourself by concentrating on your breath: This connects you to your essence. Keep exhaling negativity, inhaling calm. This helps to ground yourself and purify fear or other difficult emotions. Visualize negativity as gray fog lifting from your body, and hope as golden light entering. This can yield quick results. Negative emotions such as fear frequently lodge in your emotional center at the solar plexus. Place your palm there as you keep sending loving-kindness to that area to flush stress out. For long-standing depression or anxiety, use this method daily to strengthen this center. It’s comforting and builds a sense of safety and optimism. A recent article in the Huffington Post entitled Creating Space for ‘Non-Doing’ by Steven Leonard talks about the importance of quiet time. In today’s frenetic world where we are always connected, it’s imperative to find time to just be and sit in the quiet. I think some people are afraid of what might come to them in the quiet space between their thoughts. It’s important to go there with courage, connect, let go and trust. Welcome to Create and Blossom! Welcome to Create and Blossom! My name is Catherine and I am a Reiki Practitioner, Level 3, Karuna Reiki Level 1, and IET Level 1. My goal is to become a Reiki master and I continue to study reiki, chakras, energy, angels and spirit guides. My intent is that you relax and be open to the energy flowing into you. I am not the healer. I am merely the channel through which the universal energy flows. Please contact me at createandblossom@yahoo.com if you would like an appointment. I encourage you to read more about Reiki energy by clicking on the Reiki tab above.